An artist's impression of merging neutron stars, one of the theoretical progenitors of gamma-ray bursts and the birth of a black hole. The most intense explosions in the universe come in two varieties. One type lasts several seconds, and the others are gone in less than a second. Until now, astronomers had not pinned down the sources of the short-duration bursts. New observations show convincingly that they are created by collisions of two very dense objects, likely neutron stars or a neutron star and a black hole, as theory had predicted. The results solve a 35-year-old mystery. The explosions are called gamma-ray bursts, or GRBs. Several are recorded every day, coming from all directions of the sky. Most originate in the very distant universe. One nearby could trigger a mass extinction on Earth. Gamma rays are the most intense form of radiation, more powerful than X-rays. The afterglow of a single burst, measured in X-rays, radio waves and other wavelengths, can be billions of times brighter than the entire galaxy in which it originates. Long-duration GRBs typically last about 20 seconds. Previous studies revealed one of these is released when the core of a young and very massive star collapses in a supernova event. "Gamma-ray bursts in general are notoriously difficult to study, but the shortest ones have been next to impossible to pin down," said Neil Gehrels of NASA Goddard Space Flight Center. "All that has changed. We now have the tools in place to study these events." Astronomers have now observed two short-duration bursts in unprecedented detail and determined the likely scenario in which two dense objects collide and coalesce. "Our observations do not prove the coalescence model, but we surely have found a lady with a smoking gun next to a dead body," said Caltech scientists Shri Kulkarni. The discovery involved more than 30 researchers at 16 institutions and a host of telescopes on the ground and in space. The results are detailed in the Oct. 6 issue of the journal Nature. Astronomer Luigi Piro, who was not involved in the discovery, wrote an analysis for the journal. "The observed characteristics of the short gamma-ray bursts are all consistent with models of the merger of two neutron stars, or of a neutron star with a black hole," says Piro, of the Instituto Astrofisica Spaziale in Rome. NASA has posted an animation of the neutron star merging with a black hole here. The first burst was detected May 9 by NASA's Swift satellite and was first reported that day by SPACE.com. 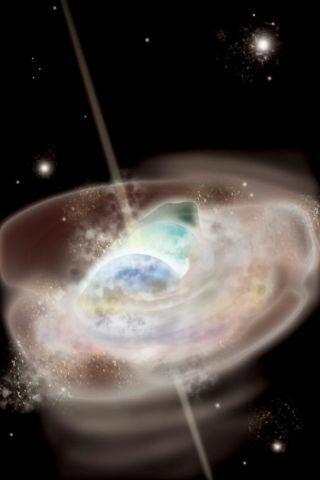 Scientists believed that morning that they were seeing, live, the merger of two neutron stars into a single black hole. Astronomers now know the event took place on the outskirts of a faraway galaxy, a location where old stellar remnants like neutron stars are known to reside. Neutron stars are the burned-out shells of normal stars. They can be as small as 6 miles (10 kilometers) in diameter yet contain as much mass as the Sun. Other studies have shown they often exist as pairs on the fringes of galaxies, and that they collide frequently. Such setups also sometimes involve one black hole, also a stellar remnant but one that is much more dense. Another burst on July 9 was noted by the HETE-2 satellite, an international project run by NASA. It lasted just a tenth of a second. Later, an afterglow of optical light from the same location was spotted by other telescopes, representing the first visible light ever associated with a short-duration burst. The July 9 event is the first for which an accurate distance is known. At a billion light-years away, it was about 10 times closer than nearly all other recorded GRBs. Calculations also show, however, that it was about 1,000 times less energetic than the others. Too weak, in fact, to have come from a single exploding massive star, helping astronomers determine that it likely involved a merger of two old stars, as theory predicts. "The mystery of short gamma-ray bursts is largely solved," said Don Lamb, a University of Chicago researcher and co-author of one of four papers describing the observations. Another important confirmation that came out of the observations: Short-duration GRBs are seen only when the jets of material that shoot from the merger are pointed at Earth. For every event we can spot, 30 other mergers go undetected, said Derek Fox of Pennsylvania State University. Figuring this out helps astronomers properly frame an important prediction of Albert Einstein. His work suggests that when neutron stars collide, a shock of gravitational waves should be released. An observatory called LIGO is ramping up in an effort to detect these waves. "It's possible now that the first gravitational wave source that LIGO observes will also be a gamma-ray burst source," said Kevin Hurley of the University of California at Berkeley. "Now that would be a spectacular discovery."